When a museum trip turns funky, Katie Lennox is catapulted back in time to Victorian London. Separated from her friends, her Starbucks and her i-Phone by more than 100 years, this smart, gutsy teen needs to blend if she's to accomplish her mission-- to stop Jack the Ripper, London's still unidentified serial killer. Katie's read about the brutal slayings; she's watched her fair share of CSI. Armed with 21st-century knowledge, and with the help of handsome Toby, can Katie unmask the man who got away with murder again and again? Can she save any of his victims? Ripped was one of those random finds that I discovered while browsing around for new books to read. Loving all things Jack The Ripper related I knew that, fiction or not, I had to check this book out. I ordered, waited and read as soon as I received it in the mail.I must admit that I was pleasantly surprised with this book. I don't know what exactly I was expecting, but for some reason I wasn't expecting it to be so good that I devoured this book in very little time. This book is told from the point of view of a fifteen-year-old girl (Katie) that goes back in time to try to stop Jack The Ripper from butchering women - one being an ancestor of Katie, whom her rock star sister looks a lot like. I loved Katie's voice in this book and, between her dialogue and references to modern-day pop culture, I think she really made this story very easy to read - even the gory and violent parts. This story is very detailed and historically accurate when it comes to the facts about Jack The Ripper - someone definitely did their research and stayed true to history where it mattered. Seeing a book that is 500+ pages long about history and time travel may seem daunting but the intrigue in the mystery of this book definitely sets the pace and you'll be through it before you know it. If you're a fan of Jack the Ripper, time travel or just a good mystery then I would definitely recommend this book. I like the title, but I think the subtitle may turn some readers off the book. This book is a must-read. I have read and re-read it and enjoyed it just as much (if not more) each time. It's a nerve wracking page turner. I read this book again with my friend when we were visiting England, and it was eerie and exciting to visit the sites mentioned in the book. It's humorous and heart warming as well as hideous and gut wrenching. Read Ripped today! Everything was captivating-- plot, setting, characters-- I loved this book. The relationship between Katie and Toby is heart wrenching. The humor is laugh out loud. The illustrations at the start of each chapter are perfect, creepy without being grotesque. I loved the cockney accents. My friends and I have started using rhyming slang from the book! Overall this book was really good. It wasn't like any of the books that I've read. I liked the time traveling and how it was relatable in some ways and how it was completely fictional in other ways. Ripped -- Rip into it! I loved this book and recommend it to people who love a thriller that is based on a true set of events. It's a lot of fun and a gripping page-turner! Ripped is a wild journey back and forth in time, with humor and terror wrapped up in a mystery that is unsolved to this day. I loved the tone, told by a 15-year-old girl named Katie, whose sister is a rock star that looks just like her ancestor, a victim of Jack the Ripper. Throw in an education in both Cockney slang and 19th Century London, and you'll be glued to the pages, as was I. Careful attention to accurate details and occasional allusions to current pop culture keep this story realistic and interesting. As an English/Language Arts teacher of eighth graders, I recommend it to avid readers. I practically read it all at once, and it's 500 pages. It's a story about a teenager who goes back in time and tries to capture Jack The Ripper, a serial killer who murdered women in 1888 in London. "Time travel" worked really well in this book and I got to learn about Victorian England and how the poor and rich "toffs" lived. I loved this book! And I loved the illustrations, all 60 of them! If you like smart, historically accurate thrillers and are not too squeamish around blood, RIPPED should be on your reading list. Ghastly authenticity! Through RIPPED’s time-traveling heroine, Shelly Dickson Carr makes history’s most notorious mystery spring to life in gruesome detail! Shelly Dickson Carr totally rocks the world of smart young-adult fiction. Smart she is, with a wicked eye and an understanding of human nature. You will hear a lot from Carr in the future. Her star shines through the London fog in RIPPED, a winner all the way. RIPPED by Shelly Dickson Carr is exactly the novel you want to curl up with and spend a long weekend traveling to nineteenth century England. It’s a deliciously thrilling romp for readers everywhere. I loved every single page! Have you ever wished you could time travel? 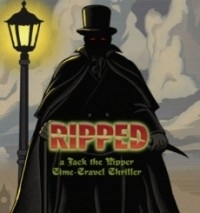 Well, after reading RIPPED, you may want to reconsider... because your journey back to Victorian London, with a smart, sassy, modern teenager named Katie Lennox as your guide, will be filled with danger, terror, surprising encounters in London’s dark alleys, a lot of nervous laughter, and the kind of page-turning excitement that would leave any reader of any age limp with exhaustion. But that’s what makes it such a terrific entertainment. So...don’t reconsider anything. Just dive in and start traveling. of Victorian London. A ripping-good novel!